Other than Maxwell Perkins or Jackie Kennedy Onassis, even dedicated readers and authors may have trouble identifying editors — and understanding exactly what they DO. This occasional feature examines how editors at UC Press bring you your favorite books. My primary responsibility is to acquire manuscripts, and to make sure that after I acquire them they’re brought to fruition and published. The process involves a lot of skill sets, including an assessment of what kinds of books and authors the Press can best publish successfully. Though it’s a naive notion on the surface, books can change the world through the ways certain ideas are understood, socially involved scholars interact and speak about the large issues of the world, and data is interpreted for a broader audience. There’s an inchoate energy between the UC system—the best public university in the world, committed to educating students across class, race, and sexual identities—and the mission of UC Press. 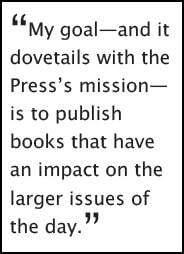 My goal—and it dovetails with the Press’s mission—is to publish books that have an impact on the larger issues of the day. I work very quickly. I’m not sure I’m a model for anyone else, but I’m very reactive: I like to get back to people expeditiously. The challenge—and it’s more difficult than it sounds—is to clear your desk so you can think about your program in a more creative way and do higher-level strategizing about what to acquire. Because I’ve been at this job for a while, people come to me all the time with their projects, but I also track down authors in various ways: through social networks, at conferences, from an article I might read in the New York Times, or through something I might see on Facebook. Often, you do have to be more assertive to acquire the books you find truly exciting and that have potential to really reach a broader audience. I do work closely with some authors in conceptualizing their books, in developing organizational frames, in helping them tease out their theses and the way they want to develop arguments. I don’t copyedit, I don’t have time for that, or even have time to do in-depth editorial work on all my manuscripts, just on books that might have an audience beyond specialists. I acquired Dora Bruder by Patrick Modiano fifteen years ago. This novella grapples with a host of issues—being Jewish in Nazi-occupied Paris, collaboration, memory, identity, and suffering—with a nuanced sensibility that really captures a noir-ish mood and dark historical moment. When the prize was announced in October we immediately sought out Modiano’s French publisher at the Frankfurt Book Fair and begged them to allow us to re-acquire English language rights for North America. Quite expeditiously—because my colleagues in production, editing, design, and marketing made it happen!—we reprinted the book within a month, and we’ve already sold over 5,000 copies! It’s been so gratifying that a book and an author I believed in received this kind of recognition. Jody Williams won a Nobel Peace Prize in 1997 for her work with the International Campaign to Ban Landmines. 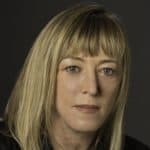 I worked really closely on her memoir, My Name is Jody Williams, to ensure Jody melded her life story—she’s a very interesting woman with a blunt and straightforward approach—with her work on the ground. What I love about Jody—and what really reflects on UC Press’s mission and on my list—is that she believes every woman can be an activist, that she’s not extraordinary, not an anomaly, and that the work continues. After she won the prize, she formed the Nobel Women’s Initiative. The prize was a high point of her life, but after she won she formed the Nobel Women’s Initiative, and she continues day in and day out to be an activist. My imprint is an acknowledgment that I’ve developed a coherent list of books that have often received lots of attention, that I’ve brought in books that have sold really well, and that my list reflects the mission of UC Press. The books I put in the imprint reflect the kinds of work that UC Press is proud to publish: books that deal with inequality, human rights, and social justice in interesting and sometimes proactive ways. An imprint is an honor … and I feel very, very grateful. 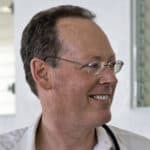 Paul Farmer is a doctor, anthropologist, and co-founder of Partners in Health. When Paul won the MacArthur “genius grant” he used the monies to build the only hospital on the central plateau of Haiti, where he’s worked for 30 years. He’s rebuilt, with Rwandan partners, the medical infrastructure of that country after the genocide. In a major new initiative, Partners in Health is now on the ground in Liberia and Sierra Leone confronting the Ebola crisis in an aggressive effort to end the epidemic. I’m his editor but I see my commitment to Paul’s work as an all-encompassing one: I support his on-going medical activism in the field and give money to Partners in Health. I’ve just published Blind Spot, a book by one of Paul’s protégés, Salmaan Keshavjee, who is also a doctor/anthropologist who has worked on drug-resistant TB in central Asia, Siberia, and Lesotho. Blind Spot takes on how corporate philanthropy and foreign aid priorities have been developed, probing the disjuncture between foreign aid imperatives and the reality of how poor people are actually treated. 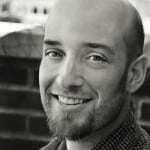 Seth Holmes (Fresh Fruit, Broken Bodies) is also an MD/PhD who has written a powerful ethnography based on his journey with farm workers from Mexico to Washington state. 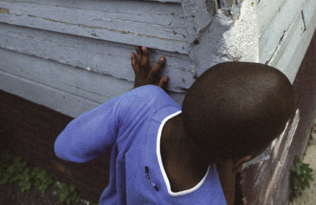 Through his understanding as an MD and as a socially engaged anthropologist, he looks at the bodily suffering of the perhaps poorest-paid and most stigmatized workers in the US—and how violence is imposed on their bodies. This first book has sold over 10,000 copies in a year, and just won the most prestigious award from the American Anthropological Association. I’ve only brought up men so far, but I’m really committed to working on gender and gender inequality, and have published an amazing coterie of feminist authors. We just published Marianne Cooper‘s books Cut Adrift, that’s gotten a lot of recognition and attention; she’s a colleague of Sheryl Sandberg, who’s been very supportive of the book. 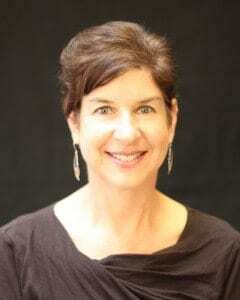 Marianne, an ethnographer and protégé of Arlie Hochschild, examines, through the experiences of families in Silicon Valley, how inequality during the economic recession we’ve just experienced plays itself out in families across the class spectrum. 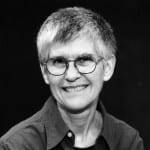 Cynthia Enloe is an unconventional political scientist who provides accessible yet provocative ideas on how patriarchy and militarism have deeply embedded themselves in our institutions and in our personal lives. We’ve just published a second edition of Bananas, Beaches, and Bases. She’s a feminist icon and a very, very generous mentor to several generations of students and activists. 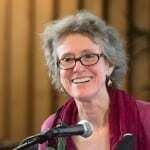 We’ve also just published a new edition of Arlie Russell Hochschild’s classic work about emotional labor entitled The Managed Heart as well as a book of her essays entitled So How’s The Family? Arlie’s probably the most important feminist sociologist in the post-war period who has altered our notions of work and family in radical ways. I work with young scholars like C. J. Pascoe who wrote Dude, You’re A Fag—a book with a provocative title to say the least. Pascoe is conducting research on a new book about teenage love that will offer a radical portrait of young people that belies our notions of their jaded cynicism. Raising the Transgender Child: Being Male or Female in the Twenty First Century, by a young sociologist at Harvard, Tey Meadows, will chart one facet of our configuring of gender in the contemporary period. This is cutting-edge stuff because we’re just now seeing the first generation of openly transgender young people come of age.